NetStaX™ EtherNet/IP™ Adapter Development Kit (EADK) with Adapter Class Stack enables you to quickly introduce EtherNet/IP Adapter (server) Class functionality to your products and systems. 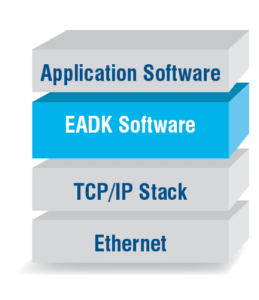 The EADK’s EtherNet/IP Adapter Class software protocol stack provides I/O server, message server and message client functionality. It also provides an application programming interface (API) for using Common Industrial Protocol (CIP) via TCP/IP. Interface the EADK with your product’s application software and socket level TCP/IP interface. The EADK source has an object-oriented approach. EADK building blocks, such as TCP/IP sessions, CIP connections, explicit requests and all implemented CIP objects, including assemblies, are grouped into separate modules with corresponding functionality. This makes the source code easy to understand and debug. *DLR object for configuration only – DLR protocol hardware and software not included. *CIP Sync object for configuration only – IEEE1588 stack not included, #DLR object for configuration only – DLR software and hardware not included.